I bake bread just about everyday, an no-knead sourdough bread is doubtlessly our favorite. Not only for its simplicity, but also for its beautiful soft crumb and crispy, crackling crust. Soups and stews are ever present in my home, and homemade bread served with plenty of butter, salt or olive oil typically accompanies those soups and stews. So I’ve written about No-Knead Sourdough before, but a number of you long-time readers struggled with the recipe. So I’ve made adjustments, tweaks and tested it every week (or a few times a week – it’s our favorite), and wanted to share it with you again in case you have a hankering for an easy artisan-style bread that’s flavorful, chewy, airy and with a crisp, thin crust. I lean upon sourdough baking in my home, avoiding quick-rise breads any most breads raised by baker’s yeast in favor of sour leavening. There’s a beautiful tradition to sourdough baking, which was the dominant form of raising breads until early in the 20th century when baker’s yeast began to replace sourdough starter as a leavening ingredient. Sourdough offers a complex, pleasantly sour flour owing to the presence of lactobacillus bacteria that gobble up the flour’s carbohydrates and produce B vitamins, most notably folate, and lactic acid as a result. Wild yeasts, captured in the bubbling starter culture which is nothing more than a slurry of water and flour (read more about sourdough starter here) give the bread its rise. The process of sour leavening also activates food enzymes in the flour, and those food enzymes breakdown antinutrients like food phytate which can bind up trace minerals. As a result, sourdough bread is richer in bioavailable minerals than quick-rise breads or those that are leavened through bakers yeast for a shorter period of time. As a result of the work of wild bacteria and yeasts that give sourdough its characteristic flavor, sourdough breads are lower on the glycemic index, higher in bioavailable minerals, and higher in B vitamins than quick-rise breads. And they taste better, too. So there’s a few tricks to baking in sourdough, and I go into them extensively in my cookbook – The Nourished Kitchen – which includes some of my favorite sourdough recipes and techniques. The real trick to making your sourdough turn out the way you like is to handle the dough lightly, and to keep your starter in the fridge unless you’re baking that day. I used to keep my sourdough starter on my countertop, as I baked almost daily. Yet, after a while, I had trouble getting the rise I wanted from the bread, and missed the super airy soft crumb I love in artisan sourdoughs. That was when a baker I know suggested leaving the sourdough in the fridge, unless I plan to bake within six hours. And that simple act of storing it in the cold made for much better results. While I find that my no-knead sourdough bread benefits from a light working of the dough and forming of the boule, I take care not to overwork the dough which can make bread flat and gummy. This video will give you a good idea on how to handle and shape your dough. When baking no-knead sourdough breads, there’s a few tools that are very helpful to have on hand. You’re likely to already have them, too. The dough for no-knead sourdough is typically very slack, and so you need to allow it a big bowl for rising. If the dough isn’t kept moist, and preferably in an airtight container, while it rises, it will develop a crust which will limit how much it can rise and change the structure of the bread. I like to use this pyrex mixing bowl set not only because they’re inexpensive, but also because they come with lids that keep an airtight environment. I also use these for soaking beans, lentils, grains, nuts and seeds. Lastly, in order for your no-knead sourdough bread to develop its characteristic airy crumb and crackly crust, it needs to bake in a hot, moist environment. Since most homes aren’t equipped with steam-injection ovens, a sturdy cast iron Dutch oven will do the trick. This keeps the bread hot, and because the steam from baking has little opportunity to escape it remains in the Dutch oven, creating a beautiful crisp and crackly crust. Dump the flours, sourdough starter, water and salt into the basin of a standmixer equipped with a dough hook (click here for the model I use). Mix the ingredients together on medium-low speed until they form a uniform ball of dough that cleans the sides of the mixing bowl, about three minutes. Oil a 4-quart glass mixing bowl (I use these because they come with airtight lids. ), and dump the ball of dough into the mixing bowl. Cover tightly, and let it rise in a warm spot in your kitchen for six to eight hours, or until doubled in bulk. Place a 6-quart cast iron or enameled cast iron Dutch oven (this is the Dutch oven I use.) in a cold oven, and then heat the oven to 450 F.
Flour your working surface, and dump the dough onto the floured surface, gently forming it into a boule. Cover it with the empty glass mixing bowl, and allow it to rise for 30 minutes. Remove the bowl, and if the dough has spread, reform it. Working quickly, open the oven and remove the lid from the preheated Dutch oven. Dump the dough into the Dutch oven, cover once more, and bake, covered, for 30 minutes. Remove the lid to the Dutch oven, and continue baking a further 15 minutes until the bread is fragrant and a light amber brown. Remove the bread from the oven and allow it to cool on a wire rack before slicing and serving. You can substitute bread flour or all-purpose flour for high-extraction flour. If you do not have einkorn flour, substitute spelt or wheat. Ha! There seems to be so many myths when it comes to cultured foods and microbes. I can assure you that the standmixer works beautifully, but, even if you don’t go there, handling the dough less will typically yield amazing results as long as your hydration levels are relatively high. thanks for this tip. though not using a mixer, I think my dense (some might say failed) sourdough loaves (still delicious), the over working the dough, even with the slap and fold method. in midst of trying your long pyrex covered recipe. thanks! Thanks for the recipe Jenny. I’m looking forward to trying it! I can’t wait to try this. You mentioned to store the starter in the fridge. When should I take it out and feed it to make the bread? On the other recipe page it says 12 hours before baking, so I’m taking mine out tonight and will bake tomorrow; I’ll let you know how it goes! Well, it turned out to be what my partner called “the best bread I’d ever made”. So I guess taking it out the night before works! I thought it could have risen a bit more, but it wasn’t terribly warm today. Good luck, and thank you Jenny for a fantastic recipe! So i am going to attempt to make sourdough bread for my first time…i am a little confused about the flour…you said use 3 cups of high extraction einkorn flour and then 1.5 cups of whole grain einkorn flour….whats the difference? Do you grind the wheat berries to get the whole grain flour? This is all new to me and i just want to get it right 🙂 thanks for the recipe and im excited to try it out! This is exactly my question. Could I use 4.5 of the jovial einkorn to get the same results? I don’t have a grain mill or access to one. Oh thank you so much for this! I saw your newsletter, and before I clicked the link, my first thought was, “I wonder if I can do this with Einkorn?” It’s the only flour we have in the house and I bought the dry blender for my Vitamix just so I can grind the wheat berries. I loooooove it, but it does not rise very high in cakes and is stickier than regular flour. I have often read the no-knead recipe and longed to try it, and now your recipe is the perfect motivation! I know it will take a few tries to get it right. One question, in your link you said you use bread flour to feed your starter. Is it possible to use Einkorn instead? Yes! You can absolutely use einkorn flour to feed a starter. I often do, because it’s what I mostly have around the kitchen. Thanks for letting me know. But I saw you did not recommend the whole grain. I was going to buy the parisian starter because I saw a recipe for Einkorn French Bread that I would probably faint dead away if I could make properly. So I will try to perfect my skills on your recipe first. We don’t eat a lot of bread, maybe once a month, or pasta (I love the Einkorn pasta as well) and eat mostly modified Paleo. But great bread once in a while is a treat. I am excited to make this recipe. I am not clear on what the difference is in the two flours. Is it possible to use the einkorn wheat berries, grind them in my vitamix and use the one resulting flour in place of the two? Thank you. I’ve never trued the cast iron dutch oven trick, how do you get the loaf out after cooking without burning your hand? I put a circle of parchment paper in the bottom of the Dutch oven. This makes bread removal so easy! I agree with Ruth. I also use parchment, but I just tear off a sheet and wad it up in a ball so it’s more “pliable” and then smooth it out, dust with a little flour and dump the dough on it. Once it’s time to put it in the Dutch oven, I just pick it up, paper and all and put it in. It bakes great, the only thing is that you will see a few little wrinkles around the sides where the parchement was once it’s cooked. When bread is done cooking, just lift it out by the parchment and set on rack to cool. Thank you so much for the recipe. Both no-knead and sourdoughs are among my favorite bread recipes. There isn’t much that is quite as delicious as fresh baked bread smothered in butter. Your photos are just beautiful! This is perfect timing… my family and I have stopped eating sprouted bread, sourdough and grains in general to help heal my oldest daughter’s cavity. It is going really well and I hope to reintroduce sourdough back into our diet… we love sourdough so much. This recipe is perfect for an every day bread… Thank you so much Jenny! Great recipe. I really want to start making my own sourdough bread but I would need a gluten free version. ANyone know of any good recipes that look as tasty as this one? Jenny do you have one by any chance? I tried this recipe using my whole grain gluten free flour mix of buckwheat, oats, corn, and flax. I have always had good sucess substiting this flour mix but I wanted to start using sourdough so I tried this recipe. the bread barely rose at all after 12 hours so I baked it anyway. It was dense but tasted good. I tried it again, once again with the same flat results. So I decied to try spelt flour. Amazing bread! What I was missing originally was the gluten! Hi Jenny, just read your recipe . I was trying to make a bread from this flour with the exception of adding fresh grounded one from the berries. I do my own sourdough from rye and wheat already for long time with good results. Do it for my husband only since I am GF . Would like him to be too but he is not ready . That’s why I am trying to do at least less damaging bread ( sourdough , no bromide and so forth) . As soon as I knew about Einkorn I started to try do something from it , with no good results at all! So , couple QQ for you : can I do starter with Einkorn flour from the beginning or it’s better to gradually add it to existing starter I already have ? Also , how the texture of this bread you make versus regular flour ? Mine was very dense and not fluffy at all . Is there special tricks to it like , for example, I noticed you have short proofing time . I appreciate your help on this issues. This has been added to my fermentation frenzy. I just can’t get enough!! Ever since I read an article about a woman who makes sourdough bread for people in cancer treatment (it’s healing), I knew I would start making it. Next I have to BUY your cookbook! You don’t mention oiling or greasing the Dutch Oven. Doesn’t the bread stick to the pan? Nope, the bread bakes clean and doesn’t stick. do you do a glutenfree version. no wheat/rye/barley/oats? I’ve made my starter from Einkorn flour. I only have the pre-ground all-purpose Einkorn. What changes in your recipe would you suggest for using this flour? I’m very excited to try this. My question is, can I use other flours such as Red Fife etc? I have a few heirloom wheat flours I’d love to try and just need to know if it needs to be part in bleached bread flour as well. You can absolutely use this recipe as a base for others. Keep in mind that the hydration levels might need to change based on the type of flour you use, so use this as a base recipe and work around from there. Where do I store my starter jar while I am feeding it? It is my third day today and I have been putting my jar in the pantry where is dark and cold for a few hours and then on my counter for a few more hours to check which place is better but I am not sure. Thanks for sharing this recipe. I started making my own sourdough bread recently and had a couple of successful ones with Bob’s Red Mill organic all-purpose and whole wheat flour but failed miserably with einkorn flour. Since your recipe is tailored for einkorn flour, I will definitely give it a try! Can you please elaborate on your tip of storing the sourdough starter in the fridge? How often do you feed it when it’s in the fridge? And how long in advance do you take it our prior to making the bread? I assume you still have to feed the starter a few times after taking it out of the fridge? So, what is “high extraction” flour? My husband has been using the Artisan Bread in 5 Minutes a Day method to make our bread with delicious results. I am excited about using this recipe and doing a sourdough bread. I have made sourdough in the past but this seems less hands on than the recipe I used before. Glad to see your recipe. I just got some rye sourdough culture and some whole grain rye flour and I have a bit of one of those older flours like whole grain einkorn flour. I want to make sourdough rye bread and think I will have to use some sort of wheat type flour to keep it from being flat as a pancake. Could you suggest proportions. I would like it to be mostly rye if possible. Thanks! I thought I’d let you know that I’ve had great success making 100% rye sourdough basically using Jenny’s no-knead method – before that you could build houses with my rye! I put the flour, salt and starter (100% rye starter) in a large bowl and add water then literally just mix it with a spoon until it is a solid mass but still very wet, no more than a couple of minutes mixing and nothing approaching kneading. I cover with cling film and let rise for 10-12 hours when it doubles in size, then, with wet hands so the dough doesn’t stick to them, shape it roughly with my hands, then put on a floured surface and roll in flour to cover then put it in a loaf tin lined with baking parchment. I then let it rise for another 8-10 hours, usually overnight. I then bake it in a hot oven for 45 mins to an hour, until you get a hollow sound when you tap the bottom – I do take it out of the tin after around 40 minutes and peel off the baking parchment. The result is a lovely and quite open (for rye) texture, moist but not too ‘heavy’, just the way I like a rye and just the right level of ‘sour’ flavour. I was so pleased to read Jenny’s no-knead explanation about how it makes the dough contract and become over-dense , it also makes it far less work! Good luck! Hey Karen, could you please let me know the exact recipe you use, how much rye flour and everything? I really want to make your sort of bread since it sounds delicious! I’m so excited! I decided to try making my own sourdough starter and I’m happy to report that it’s working! It’s three days old. I can’t wait to bake with it! I have my starter, made from Einkorn. How would I go about substituting pre ground white Einkorn flour in this recipe? I’m sure you get loads of comments, but I couldn’t refrain from thanking you for this recipe. For the first time, I feel proud (in a healthy way) of the bread I baked. In the past, I have always felt shy and embarrassed if there were guests to share in our bread. My old recipe was also a whole wheat sourdough, but it turns out so differently that I felt I had to apologize for it. The family always said they love it and ate it heartily, but they also noticed that not everyone else cared for it. With this recipe, it not only looked beautiful but tasted delicious and had a lovely texture. I am not ashamed of my bread anymore! Yay! Thank you! The family raved over it, saying it is their favorite bread I have ever made, and I am definitely not going to hesitate in sharing it with others. 🙂 You’ve made my day. I bake sourdough bread regularly for the guests in our guest house, and it is very popular. When I have formed it, I place it in a lightly greased corning ware casserole with lid, or a watered and lightly greased Roemertopf. After final rise, they are placed in the cold oven (lid on), then the oven is preheated for 15 minutes. After that the baking begins, for my recipe 30 minutes lid on, then another 20 without the lid. It turns out wonderfully! We don’t get many types of flour here in the Caribbean, so not sure if I’ll be able to try this recipe, but I do want to try a no-knead sourdough bread one day soon! Thank you, Jenny! I’ve been thinking of trying both sourdough and Einkorn flour because I’ve read that they are much better for people who have problems with modern wheat (as I do). I’ve never baked bread before, and I don’t want to invest in a mixer. I’m hoping I can get at least a tolerable bread without one. Any suggestions for doing my best without one? Karen’s comment above was helpful. Keep in mind that I’m a complete novice at this. Is it possible to use a bread machine? I think I have one gathering dust. I’ve read that it is difficult to keep an einkorn starter thriving long term due to the low gluten content. I has also read a couple of blogs that added either mashed potato, potato water and honey to the starter to solve this problem. Any comments or experience? This is the first bread I have ever attempted. I have purchased the Parisian starter as suggested by Jenny and am on Day 1 of creating my starter using the Jovial Einkorn flour. False, false and false. Gluten content has nothing to do with the efficacy of sourdough starters, and potato, potato water and honey won’t do anything to help your starter. Logically, if gluten is a problem (it isn’t), additions like potato and honey won’t do anything to help since these are gluten-free. You recipe has a lot less starter than Sally Fallon’s in Nourishing Traditions. I tried using my food processor to mix all of the ingredients for dough for the 1st time, and the dough stopped the blade from spinning. The whole thing was way too sticky to handle – it was a mess and a lot of time. Ended up taking it out and doing it by hand, but texture was much stickier than what you show on your video. I watched another video saying that you want to knead for at least 10-20 minutes to develop the gluten, so you are saying it’s not necessary? Seitenbacher makes a good stourdough starter mix. It’s marketed as a “instant sourdough” but if you add flour and water in the 1/3 ratio starter, water, flour leaving it for a day, discarding some and repeating the process. By the fourth day you’ll have a really robust German sourdough starter. I use spelt and it works perfectly and I can put it in the fridge for two weeks without touching, then pour out the hooch on top or even mold, add water and flour and it springs back to life. Also, a romertopf clay pot gives really good results. Thanks for the tip on not over kneading. Oh no! I would call lodge about that. Could I get away with using fresh ground einkorn for all of the flour?? hi Jenny! my first loaf is in the oven now! I don’t have a Dutch oven and wondered if a pan of hot water under the baking bread method from artisan bread in 5 minutes would work? also I noticed the amount of starter in this recipe is diff from the recipe in your cookbook, is that due to different flours or some other reason? Thanks! It’s a different recipe entirely. The tray under the baking bread might work, but I haven’t tried it. I am brand new to making bread and would like to try your sourdough recipe using Einkorn flour. One question: Can I use a KitchenAid food processor to grind the wheat berries? I was informed by Jovial Foods that it may not work because the flour might not be fine enough. What do you recommend for someone who does not own a grain mill? Karen, if you don’t own a grain mill, you might try a high-powered blender like Vitamix or BlendTec. Other than that, you should probably purchase ground flour. The last line said to take bread out of oven to cool on a wire rack. Should the bread be removed from the Dutch Oven before cooling on the wire rack? I love your cookbook! I’m trying the sourdough starter now. I want to bake the kefir bread…so I looked up the recipe for kefir milk, and you suggest using milk kefir grains….where do I get those? Should I buy kefir at the store and mix that with the milk? Hi, where do you suggest buying Einkorn flour? I don’t think Whole Foods would sell it? Thanks! This recipe is fantastic. I made it using a rye sourdough starter, and sprouted spelt flour. I let is rise overnight for about 12-13 hours, and because my Dutch oven doesn’t fit in my countertop over, I used a cast iron bread pan. It came out great. The first bread I’ve really been proud of, and soooo easy. The first time I made your bread I used ground eikhorn berries and just regular white flour that I had in my cupboard. Then I switched to eikhorn flour and it is just a gooey mess. I don’t own a stand alone mixer but I tried mixing it with my mix master and dough hooks, food processor and even the dough setting on my bread machine. It always is too sticky. Should I keep adding flour until it becomes stiffer? When I last tried that, I ended up with a dense, unappetizing loaf. Help me please because I would love to have a healthy bread, but delicious like my first loaf. Ps. I am feeding my starter with unable ached white flour. Could that be the problem? Einkorn is super sticky, and that’s totally normal for that flour. Resist the urge to add more flour, or your bread will become dense. Thanks for this how-to and recipe! I’ve had a starter for a couple years now, and my bread is fine but heavy. All the recipes say to knead for a really long time. But I just tried this, and it came out wonderful! All this time, I needed your advice! I kept my starter on the counter, but now I’ll try the fridge. One question: how do you make yours ready for baking? Do you take it out and give it 3 feedings, 12 hours apart, like I’ve seen in most places? Or do you just do one feeding because you want it to be chilled most of the time? I have bought your book and love it! I just tried making your einkorn wheat and herb bread (p.170) but in the stage where you let it rise for 12 to 18 hours, nothing happened and it definitely feels like it needs more water. (I used my very active and alive sourdough starter, which works so well for my 100% rye bread that I make). I then looked up your website and found this recipe, which has quite a different ratio of water to flour than the book. In the book it states: 3 cups einkorn and 2 cups high-extraction einkorn with 1.5 cups water and 1/4 cup sourdough starter. Whereas in this recipe online it says only 3.5 cups flour total, water and sourdough starter the same. Is there perhaps a typo in the book or are they completely different ways to make it? I see that the resting time for the dough is 12-18 hours in the book and only 6 hours online….could you help me out? Thanks so much! Love what you do! Hi Erica, they’re two different recipes. Both were tested (outside of my kitchen) and they both work. This one has a much higher hydration and is a much looser and rustic dough than the one in the book which has lower hydration and is a firmer loaf. I’m wondering about the same recipe. It says dough should be loose and shaggy, but it wouldn’t incorporate all the flour without being quite firm and definitely needing kneading. I can’t find the einkorn I ordered, so I’m using whole wheat and AP, but I wouldn’t expect such a large difference in hydration. i’m adding extra water, but I’m not sure just how wet “loose and shaggy” should be. Thank you for this wonderful bread recipe. My whole family enjoyed it. I think there are several of us in the comments section who need help with this :). Can you clarify what you mean about the two different einkorn flours you’re using? The Jovial website you linked us to only shows one type of einkorn flour and it’s called 100% Organic Einkorn All-Purpose Flour. It doesn’t mention anything about being “high-extraction,” that I can tell. For those of us who don’t have access to a grain mill, is it okay to just use 3 1/2 cups of this 100% Organic Einkorn All-Purpose Flour flour in place of what you called for? I am wondering the same! Not sure what flour to use and am completely new at bread baking. I am wondering exactly the same thing! I was wondering the same thing and did some research especially since I already use Jovial’s products. Then I checked out Jenny’s cookbook at the library and it confirmed my research–page 157. In a nutshell, “high-extraction” flour is basically “all-purpose” flour or whole grain flour that has been shifted to partially remove the bran. I’d caution using regular all-purpose flour though, for a variety of health reasons. The link Jenny supplied goes to Jovial’s “high-extraction” flour even though its not mentioned as such. I’m not affiliated with Jovial but I love their flour and whole grain berries! I buy mine either from their website or from Whole Foods. The other day they had a special on the flour for 1/2 off! I keep an eye out for those special and then stock up a lot! I am wondering ( as has been asked before) where to buy the whole grain Elkhorn flour for the recipe, as I don’t see it on the Jovial site. Also wondering as was mentioned above about the Jovial flour not saying it is “high-extraction.” Thanks, very excited to try the recipe. I cook mine in a clay baker–Romertopf–or in a La Cloche Dome baker with beautiful results. I think both, or something like it, can be found online at places like Amazon, Ebay or maybe even a local goodwill. This recipe made my day! I was just randomly looking at sourdough recipes. I like to bake with sourdough, but also like to avoid high gluten flours and use Einkorn a lot. We lived in France and love crusty artisan bread, but that is an infrequent treat as it requires traditional white wheat flour…. but now, this recipe!!!!! Wow, hooray- I am so excited! Thank you!!! I always see circular loaves of sourdough, is there a reason I can’t bake it in a regular loaf pan? This is by the far the simplest recipe and BEST sourdough bread I’ve baked. Thank you for sharing! I am still struggling with a bottom crust that is thick and hard. My top crust is light and crispy. Any thoughts on this? I use high extraction einkorn and then sub whole spelt in place of the whole grain einkorn. Otherwise, follow recipe exactly. Thank you! I just checked the Jovial website to try and find the 2 different flours you refer to you in your recipe, but could only find an all-purpose one. Will that suffice? 1. Using the sourdough starter at its peak–after being fed about 4-6 hrs for me. 4. Because the dough is so wet, I put the dough into a proofing basket, lined with oiled plastic wrap and then turn it out into either a hot dutch oven or a soaked clay baker. The dough doesn’t seem to deflate like others and springs right back in the oven. In the end, it steams up wonderfully with a light brown, crispy crust and lasts us about a week of sandwiches! That’s the benefit of sourdough–it stays fresh out on the counter much longer! I am really new to sourdough but I don’t think I’ve got the recipe I was given figured out yet. I was taught to make a levain first and then after the rise to do a slow cold ferment in the fridge. Have you ever done this? I think the reason the fridge works is because the co2 gets stored as carbonic acid in the cooler temperature, the heat kicks it out of this form into gaseous co2. Confused on the process for the sourdough. We will be storing our starter in the fridge, and baking once a week. When is it removed to feed and how long is it left out to feed? Or can it be fed and stored in the fridge immediately? Is it removed before baking or can cold starter be added to the dough? Thanks for such a fantastic recipe. After not being able to get my sourdough to leaven properly, I was finally able to get a beautiful loaf. It was quite slack, but popped beautifully once in the oven. I put it in the refrigerator for it’s bulk fermentation for about 16 hours in hopes of getting a bit more tangy flavor from it-but no dice. Any suggestions on how to increase the sourness of the recipe? Could I use more starter, and alter the other flour/water proportions? Any help is appreciated, thanks! Hi Jenny. I have a question. I have been baking gluten/grain free for a little over a year and was wanting to make grain free bread with garbanzo bean flour and yeast. If I let the dough sit for a few days, it will sour. Is this the same as fermenting or not? And without the use of grains, is sour dough possible? Thank you. Good tips. I haven’t tried any of the no knead breads yet. Your bread looks awesome. I am a seasoned baker of traditional breads doing it all by hand and it’s always excellent but I just made my first sourdough starter from wild grape skin yeast this fall and just bought a dutch oven. I am going to try your recipe. I haven’t been baking bread in a long time becasue I’m older and have joint problems and a small kitchen and it would be great if I can get good bread without the kneading. I love bread and haven’t even been eating it because they ruined all the grocery store bread with their new strange ingredients. Hi Jenny! I baked this bread today and I AM AMAZED! It came out so beautiful and delicious. I used all purpose and whole wheat flour. My best sourdough loaf so far. I was surprised of the little starter it uses so I was wondering if its higher on the glycemic index (cause its also less sour than what I am used to). I would love an answer if you have one! Hi! Thanks for the recipe, and I’m loving your book. Would you have a best guess if this would work for making buns? How many, and how long would I cook them? My two year old loves making his own bun for snack, well, it’s usually a car or a dog bun. I would like for him to able beat his bun up, and make some extras for hamburgers. Hi, would this recipe be a good bread to start with as a beginner baker? I’ve only made a loaf of bread once and it was with active dry yeast. I would love to make sourdough bread but I’m worried since I’ve only made that one loaf of bread. I have made lots of bread. I have to say this is my best loaf ever! Thank you SO much, this one is gonna be my daily bread! Besides delicious, it is beautiful with nice evenly spaced holes throughout the crumb! I am happy! After the rise, I had to keep putting tons of flour on my hands and on the board I dumped it onto, to even be able to attempt to shape it into some sort of ball. Adding flour would negate the goal of trying to reduce the gluten content with the long fermentation, but I really had no choice. I probably lost a fifth of the dough by what was left on my hands and the on the sides of rising bowl. I used all organic unbleached all purpose flour. I’m not Jenny, but this is what I have been doing… I did the 5 minute artisan bread recipes for about a year before getting hooked on Sourdough, and this is a similar technique. I mix the dough, let it sit overnight (or 8-12 hrs). Sometimes it visibly rises, sometimes it doesn’t… my house is a little cool during the winter, so sometimes it is a little slow. I’ve let it sit 18 hours before, and it doesn’t seem to make much of a difference except it gets more sour the longer it rises. I use organic white unbleached flour for all of the flour, and add a little extra water until the dough is “slack”/ sloppy because white absorbs differently than einkorn. After it rises, I preheat the oven and dutch oven and just dump the dough into the hot dutch oven, scraping it in with a spatula. No shaping needed. I haven’t had a failure yet, and this instantly became our favorite recipe. I just need to find an oval cast iron small roaster to make a shape that is easier for me to use. Thank’s for the super easy recipe!! I have a sourdough starter with white flour that is pretty new, can I just start feeding if Eikhorn flour? Or is there some sort of transition period? Jessica- yes, Einkorn flour is perfect for feeding your starter. Any organic flour will do if u run out of Einkorn. Non-organic flour will contain herbicides from the field drying process (wheat is often sprayed in the field to kill the plant so the attached grain will dry faster for harvest), and you definitely wouldn’t want that in your starter. You’re recipe for sourdough looks great! I’ve been baking for about 4 years non-stop and it’s a rabbit hole: baking that perfect loaf of bread is fleeting! You’re article has some great info on the bioavailability of sourdough, something which I’ve been touting for a long while. People hear the word “bread” and freak out, but they don’t realize there is a world of difference between handmade, slow, naturally leavened sourdough and that plastic-bag-bread from the market. Anyways, thanks for posting your take on this wonderful craft! Jenny and all, just a little tip to share for those who use the dutch oven: When pre-heating the dutch oven, set the lid on the rack beside the pot. This way, you don’t have to fumble with removing the lid before you plop in the dough. Can I use my large Tupperware mixing bowl instead of glass? Can a glass loaf pan be used to bake? Hi jenny! Just started making sourdough bread and already am loving watching the bread rise higher every time and the holes get bigger…one question I have: the dough is very sticky which is fine until I get ready to shape it and then I have problems getting it into a ball…any tips?! I make this recipe once a week – as pizza! The results are amazing and we love it for dinner 🙂 Thanks for sharing and thank you for the great website! PS I use spelt flour and it works great. I made the starter, I made the bread, and all is well! Thanks ! 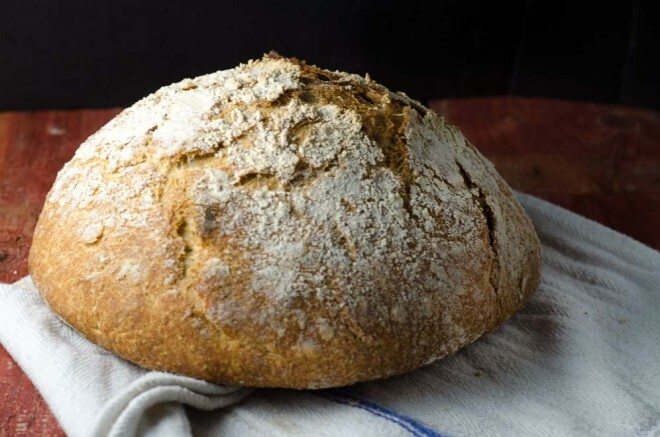 Now I want to know if I can use the same method–fooling with the hydration a bit and adding a bit of molasses–and make wholewheat-cornmeal Anadama bread. I’m going to try. How long does the refrigerator starter have to sit out before I can use it in this recipe? Could you give a timeline with the recipe? Like when do you take your starter out of the fridge? 8:00 at night? Do you feed it after it comes to room temperature and then wait longer before using it? Thanks! Hello I just wanted to point out that cast iron is not the best choice to bake anything in. Not because of how it actually cooks the food, but because it’s not a very healthy option. We all carry loads of heavy metals around in our bodies that shouldn’t be there and that cause toxicity. I used to love cast iron myself, but learned that each time you use it leaches trace amounts of iron into your system. Since heavy metals are already so present in all of our bodies today, I recommend trying to cut back as much as possible. One easy way to do that is not to cook with any metals. I only cook now with glass or clay, and even traded out my plates/bowls and silverware for bamboo and wooden versions. I have a big clay pot I used for this recipe and it came out great! Please provide citations for your assertions. You need iron, so using cast iron for cooking is healthy–especially for anyone that’s anemic. I posted this in another recipe, but thought it might be germane here, also. Hello, I have made this recipe a thousand times and it has come out well, so thank you. I split one dough into three equal parts (roughly 11 ounces each) and will bake each off separately in the cast iron. I am unsure about times. i was going to try 10 minutes lid on, 5 minutes lid off… roughly a third of the time since its a third of the dough… Have you ever tried this or can you recommend any times? I’m wondering, can I use different flowers such as hard white wheat berries. That’s what I have on hand and wanted to know how this needs to be adapted to suit more common flours. Thanks, it looks amazing and I can’t wait to try it! Hi. I just made this recipe and I am so happy with it, thank you! I have been making sourdough only for a few months and while I’ve had a few successes with different methods, this has been my favourite. It’s just so easy to do and gives such great results. I am so excited about it. Before I did this I think I was over-kneading and leaving too long to prove before baking which resulted (most of the time) in a dense flat bread. This one is the complete opposite. Thank you again! I love it, I have just discovered you blog so will definitely be checking out more recipes! I have made the starter with the Parisian loaf, and after about 10 days it was well developed. I keep it on my counter, as I bake about every other day. Other sourdough sites recommend discarding all but 4 oz. and feeding every 12 hours with 4oz water and flour, however this is a lot of waste. I chose to feed as you recommend: 1/3 c water and 1/2 cup flour once a day. I just read on this page where you recommend keeping the starter in the fridge. If I do this, how often would I feed? Still once a day? And then when would I take it out and how long would I need to keep it out before I make bread (I typically start my bread around 4PM, proof, then refrigerate overnight, then double raise. Hi, I have four kids and my parents live with us, so we have many mouths to feed and bread goes fast around here. I am so tired of buying it but have no experience, or tools for making it. How much on average do you think it costs to make a loaf of this bread? I’m trying to get an idea before I jump in and buy things! Hi Jenny! Can I use King Arthur’s Sourdough Starter in this recipe? Thanks for sharing this recipe! I’m excited to try it, but I don’t own a stand mixer. Is there anything else I could use to mix the ingredients for similar results? I have a bread machine with a dough setting and a food processor with a dough blade. Would either of those work? I’m a simple baker and mostly have plain white flour and water from a well. Will these ingredients work? And can this be made in a regular bread pan…my family wants the typical “bread” look. I made this with white bread flour and it was delicious–though I used the cast iron pan as recommended in the recipe. Turned out beautifully. I though they are the same is it not? You said you can replace the flour with spelt. I may be confused but the two flours had the same name. Or very similar. Can I replace both of them with spelt or do I need to spelt with something else? I have had failed dense sourdough for 5 years. I am so insanely psyched to try this!!! What size glass canister do you use? The link was for a 1gallon but that seems to large. If storing the starter in the fridge and preparing for a weekly bake, do I need to bring the starter to room temp BEFORE feeding it and letting it sit for 12 hours? Or can you feed a cold starter and then let it sit for the 12 hours? Thank you!!!! I’ve been feeding a sour dough starter since the end of August! I’ve made stuff with it: pancakes, muffins, waffles. But my bread failed 3 times and I just kept almost getting to it. Then I saw this post with the pans you use to rise the dough and the pan you cook the bread in. I ordered both from Amazon. My sister got me a kitchen aid for Christmas so I had no excuse. Making bread today with your recipe- and the tools- was like walking in the park. And the bread? It’s perfect. Simply perfect! The crust is just as I want it; the inside perfect; the weight in my hand as I cut it was just like the hundreds of boule I cut back when I waitressed at a farm to table restaurant. And the flavor? My husband and son loved it. But most of all I loved it. Thank you! Without your suggestions and guideance this bread would not have happened. I deeply thank you. Can’t wait to try the recipe! One thing I’m confused about though. What is the difference between the high extraction flour and regular milled einkorn flour? Can I mill fresh einkorn flour and just use that? High-extraction flour is flour that has part of the bran and germ removed through sifting, but not as much as an all-purpose flour. A high-extraction flour has about an 80% extraction rate, and an all-purpose flour will have about a 40-60% extraction rate. Jovial’s all-purpose einkorn flour is a high-extraction flour, or it was marketed as such a few years ago. Home-milled einkorn flour would be 100% extraction. You can sift the flour, removing about 20% of the flour by weight, which would leave you with high-extraction flour or you can do what I do: purchase high-extraction or all-purpose flour and when a recipe calls for whole grain flour, mill your own. I am new to baking but acquired sourdough starter from a friend and I just want to say thank you, thank you. It’s perfect, every time. I tried other recipes and had no luck. One question: I’ve read that a longer ferment (12+ hours) produces a more sour flavor (which I love) but when I try that, I exhaust the dough. It’s limp, lifeless and unbakeable after 8 hours. Any suggestions? I’m so glad you’ve enjoyed this recipe. You might consider letting your dough rise at room temperature for six hours, and then transferring it to the fridge for six more house. This may retard the yeast enough to prevent it from overproofing while still allowing the bacteria enough time to sour the bread to your liking. I haven’t tried it, though. Hi Jenny, can I use a larger dutch oven than the 6qt? For example, 7.5qt? I am getting ready to buy a dutch oven. I recommend making this recipe using the ingredients listed and equipment listed. I used your recipe here to make my first loaf of sourdough and it was awesome! I can of course tweak and improve, but it was really great – thank you! However, When I pre-heated my enameled dutch oven (I have the same one as you use) – I noticed an odd smell. After baking, the inside of my lid was darkened too. I went to the Lodge website and discovered they specifically say DO NOT HEAT their enameled dutch ovens with no food in them! Do you think this is a problem? Have you noticed a smell, or any change to your dutch oven over time baking with it this way (where you heat it for 30 mins with nothing in it)? Thanks for the advice on the enameled cast iron. I hadn’t seen that, and it’s pretty standard in no-knead recipes to preheat an enameled cast iron Dutch oven. I’ve never had a problem doing so, but will reach out to Lodge and Le Creuset for counsel. I’d encourage you to reach out to the company you’re planning to purchase from and ask them directly. So glad I came across your site, just starting to incorporate more of the Westin price lifestyle. I bought sourdough starter and getting ready to bake my first loaf. I have einkorn grain i generally grind myself for flour but noticed your recipe says high extraction Einkorn, can I just use my normal organic grain and grind my own? Thanks so much for the post — such great instructions!!!! Question — If I use organic wheat berries, would you recommend Hard Red or Hard White wheat berries? And I assume I should grind them to bread flour consistency and then try to filter out some of the bran and germ? How big is the bread roll when baked properly.. height/width, my reason for asking is that I did the math and it seems that the flour would cost roughly $15.40 alone (3.5 cups) for the 1 loaf of bread . . .am I reading this wrong? …nvm, I think It showed inacurate cups/bag from my source. I figured it out. Hi I found your name in Mindfoof magazine published in New Zealand in the South Pacific region we are neighbours but not part of Australia. Anyway greetings from the McGrouther Spellling Family in – NZ we originated from Scotland and travelled here as early immigrants I should imagine. . There are a small number of us living here so it’s not an overpopulated name by any means. Probably all related. ,! Interteated in the Stock book as it’s probably a dying art as Stock – so called can be bought in a packed a tasted nothing like the Lip sticky version of home made stock – using chicken carcass or beef bones. So neat you reached out! This is my go-to recipe for my sourdough bread, so I just had to comment. Today I made it with bread flour + whole wheat + 1/4 cup of flax meal + a little honey. It turned out perfect. No-knead bread really is the way to go! I was checking out some of your Amazon links and saw you suggest “Real Salt”. I used to buy this but consistently found grit in my sauerkraut and other ferments. It seemed that the salt would dissolve but a dark reddish pink grit would be left behind. I finally started buying Celtic Sea Salt. Have you never had this problem? The grit is where a lot of the trace minerals are. You can totally use Celtic Sea Salt, though, or any salt really. Thank you for this post! I attempted my first sourdough today. It came out pretty flat, but still tasted amazing. I think I may have jumped the gun on the starter culture and should let it “wake-up” for a few more days. – How does using more starter effect the outcome? Is the dough harder to mold and shape by chance? – How many days and/or feedings do you give your starter after taking it out of the fridge before you bake with it? Is it ok to let the dough rise longer than 6-8 hours? I’m new to the sourdough world, and have only made one loaf of no-knead sourdough bread so far. I’d like to try your recipe for my second attempt. I have a couple of questions. Could I let my dough proof for 24 hours in the first rise, instead of just 6-8 hours? Also, how long after I feed my starter should use it? I don’t have a 6qt oven. I have a 5 quart cast iron Dutch oven from Lodge, as well as a round superstone bread baker (round plate with dome lid) that is 11″ side to side and 7.75″ tall. Will either of these work for making your bread? I’m going to be making this bread, but I have a question about the sourdough starter. I have an einkorn sourdough starter (it’s new and I’ve only baked 2 loaves with it) and I refrigerate it since I bake about once a week. On the day I want to bake, when I take the starter out of the fridge, should I feed it once it gets to room temperature? If so, how long before I can use it? I always feed it before I put it back in the fridge, so I’m not sure whether it needs to be fed when I take it out of the fridge. Thanks so much for all your great information on this website! Do I need to oil the Dutch oven before putting in the oven. Won’t the bread stick if it isn’t oiled? one loaf of bread. Others give directions for a pre-fermentation, which I don’t understand why. So here goes. . .
I’m comparing directions in your book to those on this site for making sourdough bread. I’m confused what works better for you, the suggested rise time of 8 – 12 hours as listed in your book or the 6 – 8 as above? Also, how long do you let it rise a second time, 30 minutes or 3 hours? It depends on how sour you like your bread. What is the difference between high extraction and whole grain flour? Both should be einkorn but is the first all purpose and the second whole wheat? Thank you! I cannot wait to try my first bread!! Would it work to cut this recipe in half and use a smaller Dutch oven? A – Could I substitute sprouted Sorghum flour in this recipe? B – substitute Sprouted Rye flour? C- use straight kefir instead of sourdough starter? Thank you looking forward to exploring more recipes on your wonderful site! B) Yes, but you may need to adjust the hydration levels. I notice that you only give measurements by volume, not weight. For bread baking, measuring by weight is far more accurate–there are lots of variations in the way you can scoop out a cup of flour! And especially when measuring sourdough starter. It could be bubbly and full of air, which can make 1/4 cup quite different from a starter that is more relaxed. Would you consider showing weight measurements for the benefit of your non-American readers?? I want to try to make this bread. Do you think I could do it in my bread baker? Hello! Thank you for your recipe! I’ve tried it a few times now & have trouble getting a good rise. Also, the dough has come out very wet each time & the dough never forms a ball in the mixer.. Do you have any tips? Do I need to use less water? Warmer water? I’ve tried a very complicated recipe with great success, but I’d like to have a less complicated option when I don’t have the time. Thanks much! I would try 1) slightly less water, 2) a more active sourdough (make sure it’s proofed and bubbly), 3) I’d need to know what flours you’re using as that can influence hydration level. Thank you so much for responding! For flours, I have been using a sprouted whole-grain spelt for the whole-grain einkorn & an organic bread flour for the high extraction flour. I think my starter is a lot more active these days & I have better routine, so I’m hoping the recipe will work out for me. I’m still a beginner so I don’t understand hydration levels yet! ???? Thanks again! It can be tricky, but you’ll totally get the hang of it! flours, water, sourdough starter & salt? Exicited to start making what seems a very easy bread. I greatly appreciate that you have so kindly provided the shopping resoures. I am a bit confussed about the flours. Looking online I did not find “High Extraction Einkorn Flour” or Whole Grain Einkorn Flour”. Hi there, I am very inexperienced at working with sourdough but have already had a couple of successful tries. I was looking for a more simple recipe like yours. What I am wondering though is how to handle the starter. When do you take it out of the fridge? Do you feed it then or let it warm a bit? Could you fill in that gap a bit? Thanks. Generally, the night before you plan to bake, take the starter out of the fridge, and feed it. When it doubles in size, pull out what you need for bread, and then feed the starter the same amount of flour/water that you just removed. So, if you removed 8 ounce starter, feed it 4 ounces flour and 4 ounce water. Now return the starter to the fridge. The starter you pulled out of the jar, use that to make bread. I would really love the weight measurements for this recipe, can you share that? Hmmm…..the Dutch Oven can only be purchased by Amazon Prime members. How’s that for exclusion? If that’s not illegal, it should be. So, buy a different one. Hello! I read through all of the comments and although I saw my question asked, I did not see an answer from you. Would you mind weighing your ingredients next time and updating the recipe? Or are you just sure it doesn’t matter if we’re a little off? It seems that in bread-making every detail makes a difference. Thank you for this recipe, it’s the one I’ve found the most success with so far. What is high extraction Einkorn? Is that All purpose Einkorn. I am on their website and don’t see anything with this name. Jovial’s einkorn flour is high-extraction.